A few weeks ago Microsoft India's Chairman, Bhaskar Pramanik, was at a banquet hall unveiling Windows Phone 7.5, codenamed Mango, the Redmond-based software maker's latest mobile operating system. But while outwardly confident, Pramanik and his team at Microsoft India must have been hoping that Mango would keep the company from becoming irrelevant in the Indian smartphone market, which has become increasingly Android-oriented. "We built Mango around the core that people need to stay connected, because that is the single-most important reason why they use phones," said Pramanik at the launch, keen to emphasise the 'people-centric' nature of Mango and the fact that the device came hardcoded with links to Facebook, twitter and LinkedIn. Is it a case of too little too late? Globally, Microsoft's share in the smartphone operating system market fell to1.6 per cent in the second quarter of 2011 from 4.9 per cent a year earlier, according to technology research firm Gartner. The story is the same in India, notes Anshul Gupta, Principal Research Analyst at Gartner. "They sell only a few thousands," he says. Still, analysts are betting that by 2015 Microsoft will hit the third position in smartphones overtaking Symbian, Research In Motion's Blackberry OS and Samsung's Bada. Gupta says Mango is a completely new platform and has the capability to compete with Google's Android and Apple's iOS. What might do the trick for Microsoft is its pact with Finnish phone maker Nokia , whose biggest target market is India. "This is a partnership of equals," says Pramanik. Nokia devices running Mango are expected by December. "The Windows OS will lead the smartphone category (for Nokia)," said D. Shivakumar, Managing Director of Nokia India, in an interaction in late September. 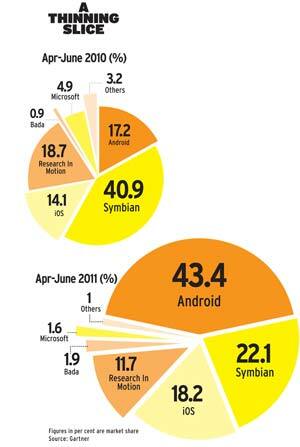 Nokia, which earlier banked on Symbian for its smartphones, has been losing market share. Taiwanese company HTC unveiled the first Mango device, Radar, in September. Samsung and Acer are both expected to launch Mango devices in India well before Nokia. Most Mango devices will be expensive at launch, but could get progressively cheap, says Pramanik. However, it will take a while before Microsoft gets a firm footing in the smartphone category. Some advantages that Microsoft is likely to leverage are an already wide channel base and deep presence in the enterprise business, thanks to its 95 per cent market share of desktop computers. Besides, it is throwing in 25 gigabytes of storage with each phone on Microsoft's 'personal cloud' platform, Skydrive, to capitalise on the users' habits of storing more and more online. There is a lot riding on Mango for both Microsoft and Nokia.